If you are ever in Arizona, you should go by the Grand Canyon. In April of ’03 , the Florida Z had less than 5000 miles on it when we arrived at the Canyon. 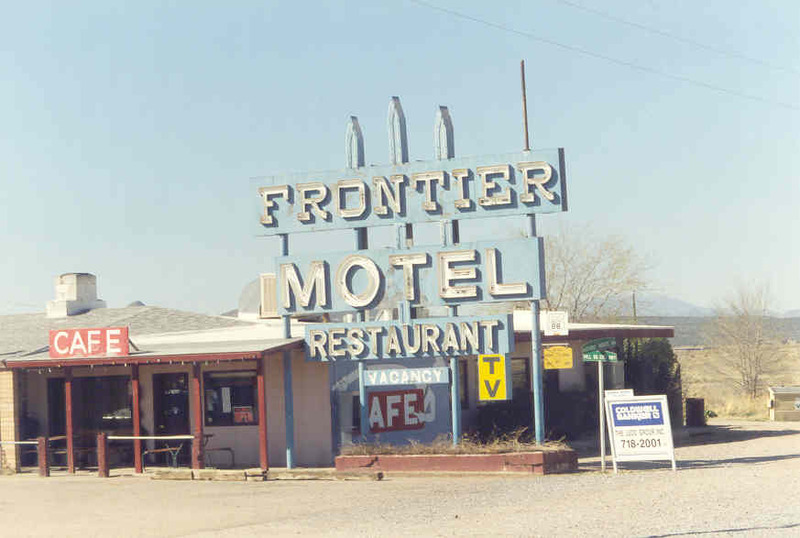 It went in the unpaved North Way, along the Navajo Trail paralleling the edge, and parked itself in front of the Maswick Lodge, a hundred feet from the rim at the Grand Canyon Village. There it stayed for three days in 119 degree temperatures, until the driver got sick of having repeated, geographical experiences resulting in repeated “Oh, WOW!! !” moments and we left. Driving West from the Grand Canyon, the main highway (the ONLY highway) snakes across desolation until a small, beat-up sign appears and directs you Northwest into the High Desert and away from the tempting fleshpots of Seligman, Arizona. It says “Historic Route 66”, and another sign says “No Food Or Fuel For Next 70 Miles”. An arrow points the way. Now that was an opportunity that me and the Z couldn’t pass up, driving on a relic of The Mother Road into the middle of nowhere, so I gassed up, followed the arrow and pointed the Z Northwest. The Atlas showed a skinny black line etched over nothingness. Soon I lost all bars on my phone. I felt the “TURN BACK” gene kick in, but I pressed on until I lost all foliage and electric poles. It was a world of rocks and dust with purple-grey mountains in the blue sky distance. 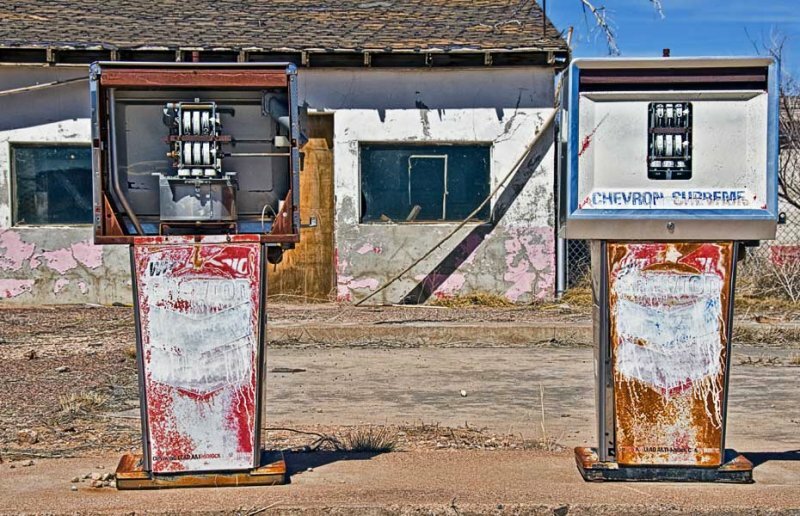 For fifty miles the road was absent any indications of humans and all but forgotten, maintenance-wise, and it led from Forlorn to Heat Sink, where there was a lone, rotted structure that flashed a red “BEER” (one of my favorite words) into the yellow-white desert afternoon. There were 8-9 vehicles parked in front, mostly dusty pickups of an uncertain vintage. They were parked far enough away from the building so that if the place decided to suddenly collapse, it wouldn’t damage what was left of their trucks. I parked the Z next to the road and went in. Inside, it was a cave; cool and dark, illuminated by other “beer” signs. The place was full of Indians, Hualapias, the real thing. This bar was the only one for 45 miles either way and it was right at the gates of their alcohol-free reservation. The customers were all the guys who take you through the Canyon on rafts, the ones who organize mule train campouts in the wilderness, and over some cool ones I heard a hundred stories of how they made a living out here where there was nothing but rocks, dust and the stars of Night. After awhile, another Indian in another decrepit pickup pulled up, and when he entered a million suns poured through the door with him, blinding everyone for a moment. He was all about the new Z by the road, agitated and excited, and everybody–even the bartender–rushed outside to see it. We all stood by the car, blinking back the sudden sunlight that glinted off the dusty Sunset paint, holding beers and talking cars. None of them had ever seen a Z before. Here was a real First. A beer-drinking, standing-in-the-road wilderness adventure involving Indians and Japanese Cars. I don’t think that this could EVER happen again. Not for free, anyway. “Bichin’ ride, Dude”, one said, making himself the only person on the Planet who has legitimately called me “Dude”. They liked it so much that they bought me beers and suggested the Buffalo Burger, which turned out to be the best meat-oriented lunch I had on the trip. So, here’s a shout out to all my old, new Native friends in Truxton,60 miles from anywhere else, where there ARE services and gas is available if you know the bartender.